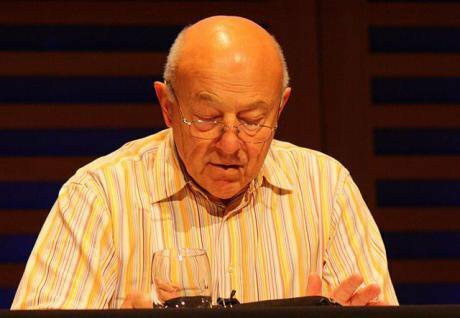 Sir John Tusa welcomes people to #clore10, 2010. Wikicommons. Some rights reserved.John Tusa first made his name as a radio and television presenter, most notably on Newsnight which he helped launch in 1980. He then moved into management, and thoroughly reformed the BBC World Service between 1986 and 1992. Another career switch took him to rescue the Barbican, which during its first decade was probably the most reviled building in Britain. He turned it into a huge international success. 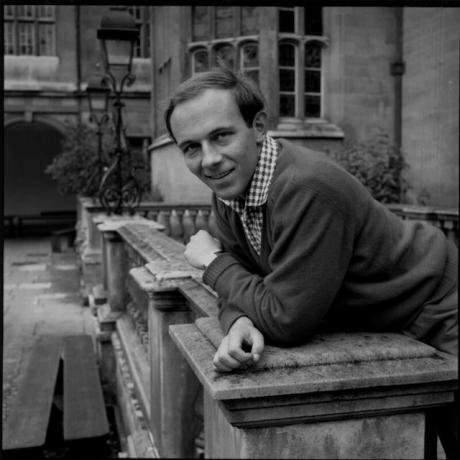 He then chaired the University of the Arts and Clore Leadership programmes. Nine unlikely months as president of Wolfson College, Cambridge, exposed the absurd shenanigans of donnish politics worthy of the satirical show Beyond the Fringe. By any standards, his was an exceptional career and one fully shared with his wife Ann. A noted historian of the Nuremberg Trials, with a crystal sharp wit, professionalism and sense of the absurd, she must have helped her husband navigate shoals of BBC boardroom politics worthy of serious study by an anthropologist. Putting down John Tusa’s book – Making a Noise, Getting it Right, Getting it Wrong in Life, the Arts and Broadcasting (Weidenfeld and Nicholson, 2018) – I am reminded of why English social mores are so baffling to outsiders, especially those who do not know British history or master the English language well. The socially grotesque sits side by side with a brilliant free spirit and inventiveness; penny pinching conservatism vies with dedication and lack of interest in money; worldliness born of empire and the might of the City of London mix with narrow provincialism to create a stage unlike any other – London is the theatre where John Tusa has been “making a noise” ever since he arrived, at the tender age of six, in 1939, from his native Zlin in what was then Czechoslovakia. I must declare an interest here as I have known John and his wife on and off for nearly forty years. Being interviewed on Radio 4 and Newsnight were akin to a fast game of tennis whose only purpose was to dazzle the onlookers – in my case with a passion to explain North African politics. The programme specialised in proper line-and-length interviewing rather than the egotism of some of the later occupants of his Newsnight chair. With John I learned, as I had a little earlier with William Hardcastle, that other legendary BBC broadcaster, that in order to achieve a really good interview, the questioner has to be as good as the person he interviews. Both were complicit but the purpose was, intellectually, a deeply serious one. Journalism is in trouble today because a rush of personal conviction, for reasons of economic necessity, has overwhelmed the essential dynamics of professional doubt. I was never afraid to voice my doubts and never had the slightest respect for the politically correct. When I first started going to the studios in Broadcasting House and Bush House, the headquarters of the World Service, I was delighted to find far more experienced journalists who shared my conviction that this was what journalism was about. When I first met John Tusa and Peter Snow, I quickly appreciated how revolutionary Newsnight was. The Falklands War was a gift to the new programme. Its coverage of the conflict succeeded in brilliantly counterpointing the Ministry of Defence’s spokesman Ian McDonald and his dictation-speed bulletins. Newsnight broke new ground by calling upon retired military officers to analyse what was going on in the distant South Atlantic. The coverage was accurate, objective and, to the establishment, very subversive. It only reinforced the notorious Thatcher-era conviction that the BBC was run by a bunch of pinkos, John’s Czech origins saw to that. John was not strictly apolitical but he distrusted ideology masking self-interest, and grandstanding masking an axe to grind. The impact was all the greater because in our era of 24/7 news it is hard to remember that, in the 1980s, the agenda, and not just in the United Kingdom, was set by the BBC. Working at the Financial Times, I will never forget the impact. A well-researched article published in the FT, followed up by a World Service broadcast, more than once resulted in a senior Algerian or Moroccan minister scolding me on the phone. The same happened to many of my FT colleagues. Politicians were respected but as Tusa has noted elsewhere so too were journalists, at least serious ones. The BBC World Service was a very stimulating place to contribute to. John Tusa, who as a freshly minted history graduate from Cambridge had in 1960 got his first job at the External Services as they were then called, introduced many changes into a slightly stuffy Bush House, “which much of my heart never left” he says, after he quit in 1992. I often thought when lunching at the canteen that no architect could have designed such an inclusive space where conversations roamed across every topic of international affairs and every dish you could imagine from Kerala to the Caribbean. It was the true heart of Bush House which brought together the “lovely, motley, raucous, passionate, straggly caravan that was Bush House with its sixty cultures (languages), dozens of tongues, hundreds of personalities and millions of connections with the world” and their many guests. John Tusa’s description of the arguments about translating from English into sixty foreign languages in Bush House is encapsulated in the view of Cervantes who thought that “a translation was inevitably the wrong side of a tapestry.” Tusa quotes a Hungarian journalist who raised “the difficulty of rendering opacity convincingly and of providing an equivalent to waffle.” As a practitioner of broadcasting in French and English, friends have often asked why my two broadcasts on the same subject in English and French seem so different. Well, as Tusa explains: ”The English language emerged as misty as its landscape, the emanation of a people who had created a language perfectly adapted to suit their own refusal to say what they mean.” This probably explains why British humour is such a powerful weapon, a skill not easily translated into other languages. Tusa’s most trenchant criticism is of the changes made in the BBC under John Birt (Director General) and Marmaduke Hussey (Chairman of the Governors, particularly the introduction of authoritarian management to an organisation whose values were liberal, humanist and pluralist. Led by Hussey the Governors made two cardinal errors. They extended the position of one director, Michael Checkland, while appointing John Birt then to succeed him eighteen months later. Having two chief executives was bad enough. Checkland was an efficient pragmatist, Birt a managerialist ideologue. For two years the BBC leadership fought itself to a standstill. It was amazing it survived. The BBC was being run by self-serving mandarins who forgot a cardinal principle of management, which is that you cannot reform an organisation – and no one doubted the BBC needed reform – if you do not love it and respect it. John Birt’s appointment as Director-General can only be described as an act of cultural vandalism which makes the Taliban look like the National Trust. The author is unflinching in his criticism but always generous to his detractors. Yes I have personally heard him dismissed as a Johnny Foreigner with ideas above his station. To conclude his career and his love of the arts by turning the Barbican into one of London’s most vital cultural assets, and its most confidently cosmopolitan, was as inspiring to those who respected him as anything he has done in an exceptional career. Tusa has no regrets but finds it dispiriting that the fight for arts funding has to be fought again and again. The value of the arts and their impact should be self-evident but the lack of interests in the arts from the philistinism of both Tory and Labour is a sad fact of British political life.